Ralph McPherran Kiner (October 27, 1922 – February 6, 2014) was an American Major League Baseball player. An outfielder, Kiner played for the Pittsburgh Pirates, Chicago Cubs, and Cleveland Indians from 1946 through 1955. Following his retirement, Kiner served from 1956 through 1960 as general manager of the Pacific Coast League San Diego Padres. He also served as an announcer for the New York Mets from the team's inception until his death. Though injuries forced his retirement from active play after 10 seasons, Kiner's tremendous slugging outpaced all of his National League contemporaries between the years 1946 and 1952. He was elected to the Baseball Hall of Fame in 1975. At the time of his death, baseball writer Marty Noble named Kiner "one of baseball's genuine and most charming gentlemen". Kiner was born in Santa Rita, New Mexico, and raised in Alhambra, California by his mother, Beatrice Grayson Kiner, after his father Ralph died when he was 4 years old. He was of Pennsylvania Dutch (German) and Scots-Irish ancestry, although his maternal grandmother was Jewish. Kiner served as a U.S. Navy pilot during World War II. Kiner made his major league debut on April 12, 1946, with the Pittsburgh Pirates. He finished the season with 23 home runs, but 109 strikeouts. After the season, the Pirates convinced future Hall of Famer Hank Greenberg not to retire. Greenberg gave Kiner hours of instruction, and in 1947, Kiner led the major leagues with 51 home runs while striking out fewer than 100 times. Many of Kiner's homers were hit into a shortened left-field and left-center-field porch at Forbes Field (originally built for Greenberg and known in the press as "Greenberg Gardens"); the porch was retained for Kiner and redubbed "Kiner's Korner". Kiner would later use "Kiner's Korner" as the title of his post-game TV show in New York. In 1949 Kiner topped his 1947 total with 54 home runs, falling just two short of Hack Wilson's then-National League record. It was the highest total in the major leagues from 1939 to 1960, and the highest National League total from 1931 to 1997. It made Kiner the first National League player with two 50 plus home run seasons. Kiner also matched his peak of 127 RBIs. From 1947 to 1951, Kiner topped 40 home runs and 100 RBIs each season. Through 2011 he was one of seven major leaguers to have had at least four 30-HR, 100-RBI seasons in their first five years, along with Chuck Klein, Joe DiMaggio, Ted Williams, Mark Teixeira, Albert Pujols, Ryan Howard and Ryan Braun. Kiner's string of seasons leading the league in home runs reached seven in 1952, when he hit 37. This also was the last of a record six consecutive seasons in which he led Major League Baseball in home runs, all under the guidance of manager Billy Meyer and Pirate great Honus Wagner. He was selected to participate in the All-Star Game in six straight seasons, 1948 to 1953. A quote variously attributed to Kiner himself, as well as to teammates talking about Kiner, was "Home run hitters drive Cadillacs and singles hitters drive Fords." Footage of Kiner hitting a home run in Forbes Field can be seen in the 1951 film Angels in the Outfield. On June 4, 1953, Kiner was sent to the Chicago Cubs as part of a ten-player trade. The Pirates traded Kiner, Joe Garagiola, George Metkovich, and Howie Pollet to the Cubs in exchange for Bob Addis, Toby Atwell, George Freese, Gene Hermanski, Bob Schultz, Preston Ward, and $150,000. This was largely due to continued salary disputes with Pirate general manager Branch Rickey, who reportedly told Kiner, "We finished last with you, we can finish last without you." Kiner played the rest of 1953 and all of 1954 with the Cubs, finishing his career with the Cleveland Indians in 1955. A back injury forced him to retire at the age of 32, finishing his career with 369 home runs, 1019 runs batted in and a .279 lifetime batting average. Kiner throws out a ceremonial first pitch at Citi Field, 2011. In 1961, Kiner entered the broadcast booth for the Chicago White Sox. The following year, Kiner, Lindsey Nelson and Bob Murphy began broadcasting the games of the expansion New York Mets on WOR-TV in New York City. The trio rotated announcing duties. Kiner also hosted a post-game show known as "Kiner's Korner" on WOR-TV. Nationally, he helped call the Mets' appearance in the 1969 World Series for NBC Radio. He won a local Emmy Award for his broadcasting work. Kiner was known for his occasional malapropisms, usually connected with getting people's names wrong, such as calling broadcasting partner Tim McCarver as "Tim MacArthur" and calling Gary Carter "Gary Cooper". He even once called himself "Ralph Korner". Despite a bout with Bell's palsy, which left him with slightly slurred speech, Kiner continued broadcasting for 53 seasons. Kiner's tenure with the Mets was the third-longest for an active broadcaster with a single team as of his final season. He is the third longest-tenured broadcaster in baseball history, trailing only Los Angeles Dodgers announcers Vin Scully (1950–2016) and Jaime Jarrín (1959–present). His traditional home run call—"It is gone, goodbye" was a signature phrase in baseball. Kiner appeared occasionally on SportsNet New York (SNY) and WPIX, which currently televise Mets games. During these visits (usually once a week), regular announcers Gary Cohen, Keith Hernandez, and Ron Darling made room for Kiner as he shared stories of old-time baseball, as well as the current state of the game. During his final season (2013), he was the oldest active announcer in Major League Baseball. Partly owing, as Kiner once said, to the fact that Hollywood megastar Bing Crosby was part-owner of the Pirates, Kiner was often closely linked with the likes of celebrities such as Crosby's colleague Bob Hope and Frank Sinatra, but even more to publicized romances, dates or just splashy photos with leading ladies, such as Elizabeth Taylor, Ava Gardner and Janet Leigh. Kiner was also married to Barbara (née George) Kiner, from 1969–1980; and to DiAnn (née Shugart) Kiner from 1982 until her death in 2004. Ralph Kiner died from natural causes in Rancho Mirage, California on February 6, 2014 at the age of 91. His family was at his side at the time of his death. Upon his death, New York Mets owner Fred Wilpon stated "Ralph Kiner was one of the most beloved people in Mets history—An original Met and extraordinary gentleman." At the time of his death, Kiner was battling Bell's palsy, and the effects of a stroke he had suffered a decade ago that forced him to cut his schedule to a handful of games a season. On February 21, 2014, an online Twitter petition was started to rename Citi Field Sections 132–134 as Kiner's Korner, to commemorate the 52-year Mets career of Ralph Kiner. As of March 29, 2014, the petition had over 5000 followers. Kiner is survived by ex-wife, Ann Benisch (after their marriage ended in divorce), and also by sons Ralph and Scott; daughters, Kathryn Chaffee Freeman, Tracee Kiner Jansen and Kimberlee Kiner; and 12 grandchildren. Ralph Kiner's number 4 was retired by the Pittsburgh Pirates in 1987. Kiner was inducted into the Baseball Hall of Fame in 1975. Kiner had garnered 273 votes by the Baseball Writers' Association of America, one more than the minimum required for election. It was in his final year of eligibility (his 13th, as no vote was held in 1963 and 1965), and it was the closest call possible for any player elected by the BBWAA. (He would have had a chance later with the Veteran's Committee had he not been elected by the BBWAA). Kiner was also the only player voted in that year. He attended every Hall of Fame ceremony from the time he was inducted, until his death. The Pittsburgh Pirates retired his uniform number 4 on September 19, 1987. The Sporting News placed him at number 90 on its 1999 list of "The 100 Greatest Baseball Players, and he was one of the 100 finalists for the Major League Baseball All-Century Team that year. 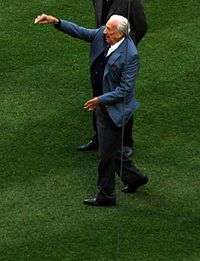 The Mets honored him with an on-field ceremony on "Ralph Kiner Night" at Shea Stadium on Saturday, July 14, 2007. On that night, fans were given photos of Kiner. Tom Seaver was present, giving a commemorative speech recalling Kiner's legacy. Other guests of note were Yogi Berra, Bob Feller, and broadcaster Ernie Harwell. As a present from the Mets, Kiner received a cruise of his choice. ↑ Weber, Bruce. "Ralph Kiner, Slugger Who Became a Voice of the Mets, Dies at 91". The New York Times. February 6, 2014. Retrieved 9 November 2016. 1 2 3 4 Noble, Marty (February 6, 2014). "Kiner, Hall of Fame slugger, broadcaster, dies at 91". MLB.com. Major League Baseball. Retrieved February 6, 2014. ↑ "Find A Grave Memorial for Ralph Macklin Kiner". Retrieved 4 November 2016. 1 2 Baseball Digest, 1948, by Charles J. Doyle of the Pittsburgh Sun-Telegraph. ↑ Corbett, Warren. "Ralph Kiner". Society for American Baseball Research. Retrieved 7 February 2014. ↑ Ruttman, Larry (2013). "Henry "Hank" Greenberg: Hall of Fame Infielder and Outfielder, Revealing the Survival of American Judaism Generation by Generation". American Jews and America's Game: Voices of a Growing Legacy in Baseball. Lincoln, Nebraska and London, England: University of Nebraska Press. pp. 23–29. ISBN 978-0-8032-6475-5. ↑ Ritter, Lawrence (1992). Lost Ballparks: A Celebration of Baseball's Legendary Fields. Penguin USA. pp. 66–67. ISBN 0-14-023422-5. ↑ Ralph Kiner Statistics. Baseball-Reference.com. Retrieved on January 16, 2009. ↑ The Baseball Biography Project. Bioproj.Sabr.Org. Retrieved on January 16, 2009. ↑ "Ralph Kiner traded to Cubs". Lodi News-Sentinel. 4 June 1953. Retrieved 7 February 2014. 1 2 3 Kupper, Mike (February 6, 2014). 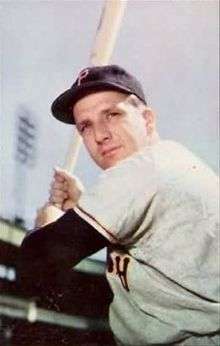 "Ralph Kiner dies at 91; Hall of Fame slugger with Pittsburgh Pirates". Los Angeles Times. Retrieved February 6, 2014. ↑ Taaffe, William (May 20, 1985). "Legends Of The Err Waves". Sports Illustrated. ↑ Sandomir, Richard (March 12, 1999). "Kiner Signs A 2-Year Deal". The New York Times. Retrieved May 6, 2008. ↑ "Mets Broadcasters". MLB.com. Retrieved February 10, 2011. ↑ Madden, Bill. "Ralph Kiner, Mets broadcasting legend and Hall of Fame Pirates player, dead at 91". NY Daily News. NYDailyNews.com. Retrieved 23 May 2015. ↑ Perry, Dayn. "Photo of the Day: Ralph Kiner, ladies' man". CBS Sports.com. CBS Broadcasting Inc. Retrieved 23 May 2015. 1 2 Weber, Bruce. "Ralph Kiner, Slugger Who Became a Voice of the Mets, Dies at 91". The New York Times. Retrieved 23 May 2015. ↑ Kemper, Patricia. "DiAnn Shugart Kiner". Findagrave.com. Retrieved 23 May 2015. ↑ Barnes, Mike. "Ralph Kiner, New York Mets Broadcaster, Dies at 91". Hollywood Reporter. Retrieved 23 May 2015. 1 2 Kohn, Bob. "Ex-Pirates great Ralph Kiner dies at 91". TribLIVE Sports. Trib Total Media, Inc. Retrieved 23 May 2015. ↑ Madden, Bill (February 6, 2014). "Ralph Kiner, Mets broadcasting legend and Hall of Fame Pirates player, dead at 91". New York Daily News. Retrieved February 6, 2014. ↑ "Hall of Fame slugger Ralph Kiner dies at 91". The Chicago Tribune. February 6, 2014. Sports XChange. Retrieved February 6, 2014. ↑ Axisa, Mike (February 6, 2014). "Hall of Famer Ralph Kiner passes away at 91". CBS Sports.com. Retrieved February 6, 2014. ↑ Satriano, David (February 6, 2014). "Mets legend Ralph Kiner dead at 91". The New York Post. Retrieved February 6, 2014. ↑ Post Staff Report (March 1, 2014). "Fan pushes Mets to create 'Korner' to honor late broadcaster". The New York Post. Retrieved March 1, 2014. ↑ Met Kiner's Korner | Twitter. Twitter.com. Retrieved on March 29, 2014. ↑ National Baseball Hall of Fame and Museum: Hall of Famer detail. Baseballhalloffame.org (October 27, 1922). Retrieved on January 16, 2009. ↑ National Baseball Hall of Fame and Museum: Hall of Fame Vote Totals. Baseballhalloffame.org. Retrieved on January 16, 2009. ↑ Mets Hall of Fame | mets.com: History. Newyork.mets.mlb.com. Retrieved on January 16, 2009. ↑ Pirates Retired Numbers | pirates.com: History. Pittsburgh.pirates.mlb.com. Retrieved on January 16, 2009. Wikimedia Commons has media related to Ralph Kiner.